Evos are cool cars. 4G63 powered, all wheel drive. 4 doors. Even though they are a heavily front drive platform, they preform well on the track, and in rallying, which is where this special edition gets its name. 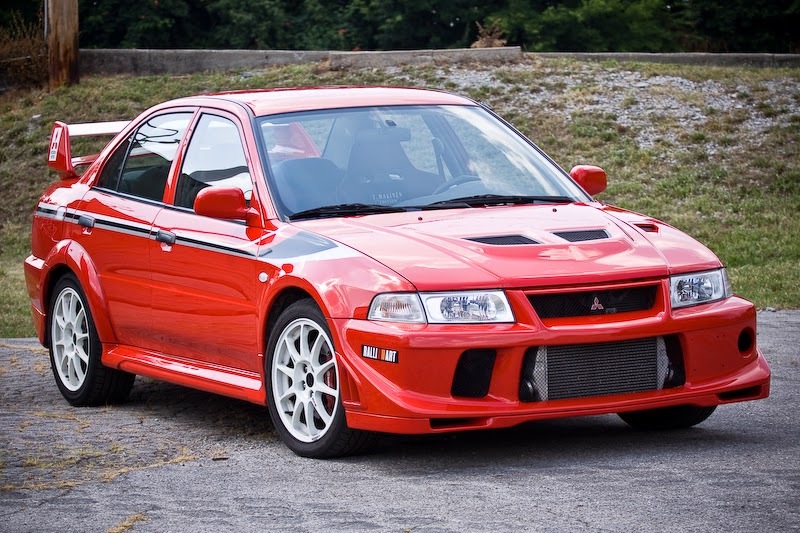 Tommi Makinen was a four time World Rally Champion that drove the Mitsubishi Lancer Evolution in each. This car was a variation on the normal Lancer Evolution. I haven't seen any production numbers, but it seems that more than 500 were produced. This vehicle was not approved for Show or Display. Fun car, too bad. Yet another special edition Evolution VI was released in 1999: the Tommi Mäkinen Edition, named after Finnish rally driver Tommi Mäkinen that had won Mitsubishi four WRC drivers championships. It featured a different front bumper, Red/Black Recaro seats (with embossed T. Mäkinen logo), 17" Enkei white wheels, a leather Momo steering wheel and shift knob, a titanium turbine that spooled up more quickly, front upper strut brace, lowered ride height (with tarmac stages in mind), and a quicker steering ratio. Amongst other colours, the Evo VI came in either red (Tommi Mäkinen Edition only), white, blue, black or silver with optional special decals, replicating Tommi Mäkinen's rally car's colour scheme. This car is also sometimes referred to as an Evolution 6½, Evolution 6.5, or TME for short. Evo Magazine buying guide for the Mitsubishi Lancer Evolution - TME.